For Earth Day, Kindergarten was read the Dr. Seuss book, The Lorax and then they drew pictures in KidPix showing what they think the Lorax’s world looked like after the boy was given the seed. You can see the pictures on our Earth Day page on the wiki along with the projects completed by other grades for Earth Day. Kindergarten was also busy at the end of the year finishing up their Adventures In Keyboarding project which were printed as mini-books. I hope that you had an opportunity to see them and that you realize that your student typed all of the words themselves! They all did a great job. Kindergarten was very busy at the end of the year but they still had time to play some educational games including trying out JumpStart 1st Grade! 1st Grade was busy at the end of the year finishing up their Adventures In Keyboarding project. These were printed as mini-books and I hope that you had an opportunity to see them. All of the students did a great job using the keyboard to type in all of the words themselves. 1st Grade also were measured again for the How Tall is a 1st Grader project, drew a picture to illustrate comparative heights and played some measurement related online games. Check out our How Tall page to see how much our 1st Graders grew and to watch a slideshow of pictures drawn by the 1st Grade to show comparative heights. Did you receive your Mother’s Day card? 1st Grade created these using Kerpoof Studio which can be used at home too. The computer lab partnered up with the 1st Grade art program to help colorize pictures that each 1st grade student had taken. Using a program called, PhotoFiltre, each student colored their close up image 4 times. 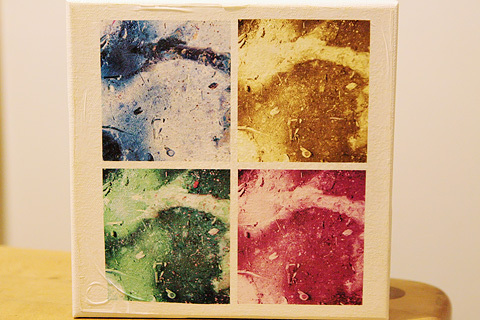 These were then printed by the mom doing the art program and put on to canvas. I was lucky enough to get one as a gift from the 1st grade. I hope you loved yours as much as I love mine! As if that’s not enough, 1st Grade also spent time on various web sites playing educational games and even had a chance to try out Jumpstart 2nd Grade! After the Monster Project was complete, 3rd Grade ended the year by trying to help the robot Botley save the world from Polly Sparks’ attempt to change history by playing the educational game, Jumpstart 3rd Grade. 3rd Grade’s Plant Life Cycle projects did finally get posted to the Travel Scrapbook but in case you missed them, here they are. 4th Grade finished off the 2008/2009 year by completing their Keyboarding Boot Camp and finish the last two Voices of the World Projects. The goal of Keyboarding Boot Camp was to improve keyboarding technique which will in turn improve keyboarding speed. The average increase in speed during the 12 class session was 60% with an average typing speed of 20wpm. All but two of the 4th grade students met or exceeded their goal for the class. Keyboarding instruction will continue in 5th Grade and beyond. The April Voices of the World Project was all about the planets. Each 4th grader drawing a planet (or the sun) and then recorded themselves saying their planet’s name. This project included Pluto even though Pluto is not considered a planet any more. 4th Grade also visited some web sites about the planets to see what each planet looks like and read some facts about the planets and used an online image editor called SUMO Paint to create the planet pictures. May’s task was a celebration of the two years of the Voices of the World project. Each school was to say in their own language: Happy Anniversary, Two years of Voices of the World, Congratulations all. Finally, 4th Grade took an End of Year Survey about the projects and activities they did in the computer lab during the year. 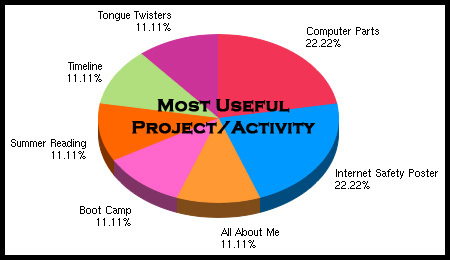 As you can see from the results, the favorite activity for the year was the Tongue Twisters. If you haven’t watched and listened to this one you really should. 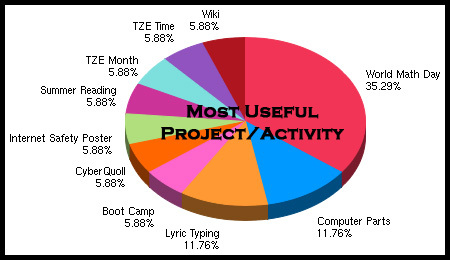 Coming in as the least favorite project or activity for 4th Grade was Keyboarding Boot Camp. Interestingly though, the majority of the 4th Graders hope to learn how to type better in 5th Grade. 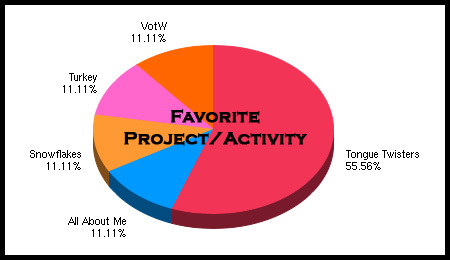 The votes for the Most Useful Project or Activity were split between many projects and activities with the Computer Parts & Internet Safety activities slightly edging out others. I look forward to having this class in 5th Grade and look forward to seeing how fast some of them will be typing by the time the enter Middle School! Once the time & month portions of this project were complete, each 5th grader also answered a series of questions reflecting on the Time Zone Experiences project. The end of the year included some keyboarding lessons for those finished with other work. Keyboarding is a major part of 6th Grade so those that didn’t have keyboarding time this year will get it in 6th Grade. Touch typing using correct technique is a skill that will be useful not only during Middle School but will be invaluable in High School and beyond. I would encourage your children to practice their keyboarding skills over the summer as we would like them to type at least 30 WPM by the end of 6th Grade. Check the Summer Ideas page for links to keyboarding sites but practice does not have to be actual keyboarding sites. Keyboarding skills can improve while IMing or playing games online or emailing, etc. as long as the correct technique is used each and every time any typing is done. Take some time to watch your child as they type and encourage them to properly position their hands and to use the correct fingers for typing. It’s much easier to learn to do this correctly then to have to unlearn bad habits. 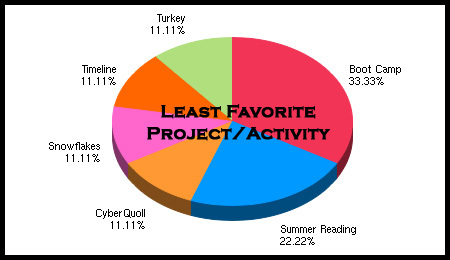 5th Grade also completed an End of Year Survey about the projects and activities they did in the computer lab during the year. 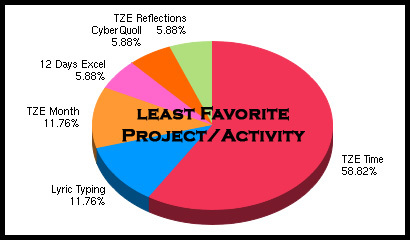 As you can see from the results, the favorite activity for the year was World Math Day. 5th Grade really enjoyed the online math activities that we did this year. If you child would like to keep up with their math facts during the summer, they can visit Tutpup and Arcademic Skill Builders and complete against others from around the world. While some of the students rated the month portion of the Time Zone Experiences project as their favorite activity, the least favorite activity was by far the time portion of the Time Zone Experiences project. This was a tough project with a lot of new skills. I am proud of all of the students for finishing the work and hope that they learned something in the process. The majority of the 5th Grade felt that the World Math Day activity was the most useful to them. The final question on the survey was What do you hope to learn in computers in 6th Grade? The majority of the students hoped to improve their keyboarding skills in 6th Grade. I am looking forward to the 2009/2010 with this class. We will be spending time on keyboarding and improving our knowledge of Microsoft Word as well as learning more about Internet Safety and much, much more.